It is a commonly known fact that, unfortunately, many insurance company adjusters and juries have an innate bias against motorcyclists. Sadly, this prejudice often effects their treatment of injured or wrongfully killed motorcyclists. Insurance companies and Massachusetts juries hold preconceived notions about the actions and driving habits of motorcyclists. 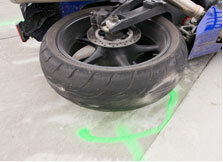 For nearly three decades, the Boston motorcycle accident lawyers at Bellotti Law Group, P.C. have worked to change this illogical and stereotypical attitude, winning their injured and wrongfully killed motorcyclists the compensation they deserve. These misconceptions are common, but we refuse to let them negatively affect your case. Our Boston personal injury attorneys know that motorcyclists, like every other motor vehicle operator, has rights and responsibilities pursuant to Massachusetts state law. When another driver abandons these responsibilities and causes injuries or death to a motorcyclist, we hold them accountable for their negligence. Contact our Boston, Cambridge, or Quincy office today at 617-225-2100 for a FREE consultation to discuss your recovery options. Many people lump all motorcyclists into a group of renegade, lawless "motorcycle gang" bikers. In reality, the vast majority of motorcyclists are attentive, careful, and adhere to the rules of the road. Nevertheless, because of the near-misses many motorists have experienced at least once with a motorcycle, their attitudes are influenced. We have all, at one point, witnessed a negligent motorcyclists, weaving in and out of traffic, lane-splitting, traveling at high speeds, passing in the breakdown lane, and narrowly avoiding other vehicles. Due to the actions of those few bikers, drivers have developed a cultural bias against all motorcyclists, erroneously viewing them as reckless, irresponsible, and unruly. Quite simply, this is off-base in 99% of all cases. Our attorneys know that most often, another drivers negligence and carelessness, not the motorcyclists, causes an accident resulting in serious injuries or death. We refuse to let cultural bias strip you or what you deserve and we hold all at-fault parties liable for the actions. The Boston motorcycle accident attorneys at Bellotti Law Group, P.C. have successfully negotiated with insurance companies and skillfully litigated in court for countless motorcycle accident clients and their families. We know insurance company tactics and aggressively challenge their bias. Further, we understand the unique complexities involved with presenting your case in court and will successfully convince a jury of the other party's negligence and liability. In short, we will not rest until we win you every dollar you deserve to compensate your medical bills, rehabilitation costs, pain and suffering, and lost wages. We will stand up, confront, and fight to prevent and reverse any undeserved bias in your case. Call the Boston motorcycle accident lawyers at Bellotti Law Group, P.C. today at 617-225-2100. We begin investigating your case immediately and will draft an individually tailored strategy of how to achieve the most favorable results possible for you, our client. We have offices in Boston, Cambridge, and Quincy and serve all of Massachusetts and Southern New England.